Once that's done, you can re-load this page and get back to creating your free trial on Playbill Professional. If you need help creating your account, please call us at (212) 557-5757 or send us an email at hello@playbillpro.com. Email: You will use your email to sign in. We will never spam you or sell your information. To prevent SPAM, please finish the name of the Broadway show listed above. Your 14-day free trial will last until midnight on May 7, 2019. 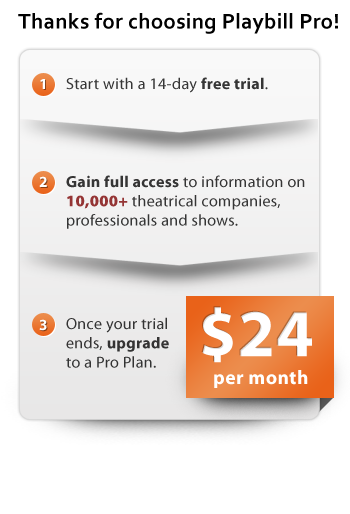 Once your free trial has ended, you will still be able to sign in to Playbill Professional to submit and update shows, people, companies and theatres but to get full access you'll need to upgrade to a Pro Plan. By clicking Create My Account, you agree to the Terms of Service, Privacy and Refund policies.